The XOWComics.com Toolbar for Firefoax adds a complete set of navigation points, including full search functionality, to the toolbar of your Firefox browser. All navigation points within the site are available in a single location, even allowing you to maintain run searches with all of the options available within the site, directly from your Firefox toolbar. And, it is as compact as can possibly be to not clutter your interface. 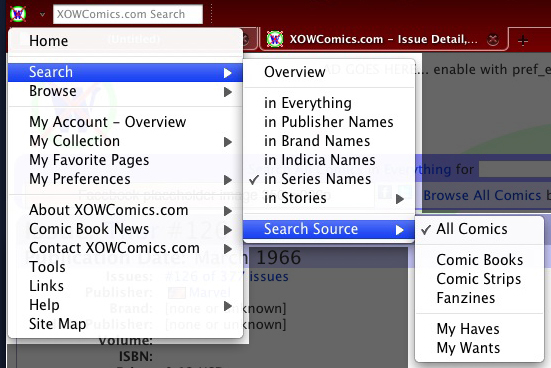 The XOWComics.com Search tool adds the XOWComics.com "search for everything" functionality to any OpenSearch compatible browser. With it, you can search XOWComics.com just like you can search Google, Yahoo, eBay, and literally thousands of other OpenSearch compatible search sites directly from the search bar in your browser. XOWComics.com Toolbar for Firefox v0.3.0 (released February 19th, 2011): As a very simple extension for Firefox, the XOWComics.com Toolbar merely adds a toolbar to the browser for direct searching and navigation to the complete XOWComics.com site. Of course, as we build more tools and functionality into the site, the XOWComics.com Toolbar will be update to support the new navigational areas and to slowly expand the direct functionality. View a screen shot of the new XOWComics.com Toolbar for Firefox here. Ideally, you should use the Mozilla Addons site to install the XOWComics.com Toolbar. You can also choose to install XOWComics.com Toolbar for Firefox directly from our site. In the near future (first half of 2011), we will be expanding the XOWComics.com Toolbar for Firefox to integrate more cleanly and directly with My Account in XOWComics.com. Dynamic support for Publication Types My Boxes will be included. And, we will then start integrating the toolbar more directly with the Editor Tools in the site. XOWComics.com Search v0.3.0 (released February 19th, 2011): The XOWComics.com Search tool allows for the addition of XOWComics.com as a search engine to all OpenSearch compatible browsers (Internet Explorer v7 and above, Chrome, and Firefox v2 and above). Probably the simplest addition, for compatible browsers the XOWComics.com Search tool automatically performs searches on series name within the XOWComics.com site. There is no simpler way to find the comic books you are looking for and the tool will automatically keep itself updated for you safely and securely. View a screen shot of the new XOWComics.com Search tool here. To install the XOWComics.com Search tool, merely look at your search bar in your browser. On the left side there should be a drop down item listing your existing search engines. There should be an option there now (for compatible browsers) to install the XOWComics.com Search tool. If you so prefer while using Firefox, you can use the Mozilla Addons site to install the XOWComics.com Search tool. You can also choose to install XOWComics.com Search tool directly from our site.